Abcam’s 20 HETE competitive in vitro ELISA (Enzyme-Linked Immunosorbent Assay) kit is designed for the determination of 20 HETE (also known as 20-OH-AA) levels in biological samples. The specificity of the 20 HETE ELISA was investigated using authentic 20 HETE and a panel of fatty acids which, based on their structure, might be anticipated to compete with 20 HETE for binding to antibodies for 20 HETE. Anti-20 HETE did not cross-react with 14,15- and 11,12-DHETs, PGE2 and showed almost no cross-reactivity even with structurally extremely similar arachidonic acid (AA), linoleic acid and linolenic acid as shown in the competitive ELISA analysis. Considering the only difference between 20-HETE and AA is an oxygen molecule, the specificity of this kit is a surprise. Human essential and salt-sensitive hypertensions were related to differential AA metabolism by cytochrome P450 (CYP) 4A which has AA-ω-hydroxylase (20 HETE synthesis) activity. Increased circulating insulin inhibits 20 HETE synthesis in obese hypertensive subjects. Recently, CYP4F2 genetic variants, which increased urinary 20 HETE secretion, were found to be correlated with the risk for hypertension in a Chinese population. This kit can be used for the determination of 20 HETE in serum, plasma, cells and tissues following proper isolation and purification. Our Abpromise guarantee covers the use of ab175817 in the following tested applications. 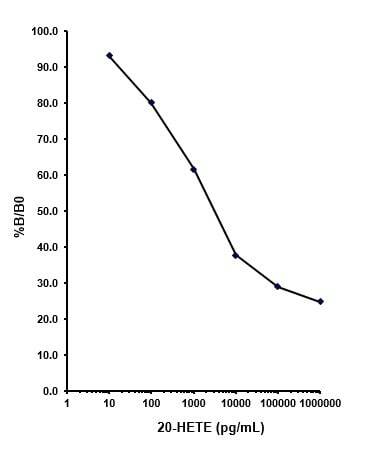 Example of standard curve obtained with ab175817. ab175817 has not yet been referenced specifically in any publications. Publishing research using ab175817? Please let us know so that we can cite the reference in this datasheet. There are currently no Customer reviews or Questions for ab175817.